If you spent most of your life paying as much as legally possible into the system, and you retire in 2019 at age 65, your monthly benefit will be $2,757. It jumps to $3,770 if you delay retirement until age 70. 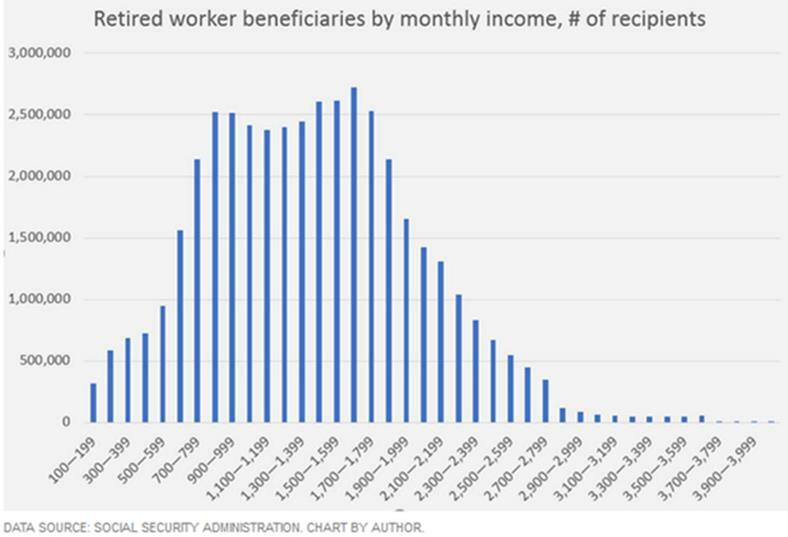 A solid majority of Social Security recipients receive $2,000 a month or less, and many less than $1,000. The average benefit is $1,413, according to Social Security’s latest fact sheet. If that’s all you have, your retirement lifestyle is not going to include many cruises and golf tournaments. Of course, it shouldn’t be all you have. Social Security was never supposed to be a complete multi-decade retirement plan. It was designed to keep retired workers out of poverty at a time when lower life expectancies kept retirement much shorter for most—if they lived to 65 at all. Now we live longer, and we have higher expectations, which political leaders have done little to dampen. Often they’ve done the opposite. Ideally, people should avoid relying on Social Security and accumulate other savings as well. Many, perhaps most, do not. The reasons vary.